HERE'S WHAT MAKES THE MEGA TORQ THE STRONGEST, MOST RELIABLE TORQUEFLITE TRANSMISSION AVAILABLE TODAY. -a BRAND NEW 727 CASE which is stress relieved with all flashings removed. Machined and true in every critical detail, these cases have never been subjected to impact, corrosion, misalignments, vibrations, broken "u"joints or driveshafts, stress cracks or wear of dowel holes, internal bores or stripped thread holes, common to used cases. TECH NOTE: The case plays a much more critical role in transmitting torque to the driveshaft. In order to provide 3 different gear ratios from the engine to the driveshaft, the transmission must lock a component to create a leverage to change the input shaft speed to the output speed. This is accomplished through the use of a one-way roller clutch anchored to the rear of the case, and one of 2 brake bands that are also anchored to the case. This anchoring is subjected to as high as 7 times the torque output of the engine. Therefore the strength and integrity of the case is critical. -extensive use of BILLET and structurally reinforced components. Years of innovation and technology have lead to the development of high strength components that eliminate areas that could not standup to the stress demands of todays' huge engines. We are now able to incorporate these innovations into our MEGA TORQ to provide the performance and reliability necessary to transmit the high torque and high horsepower produced. Billet components are machined from high strength blocks of steel or aluminum that are also heat treated in some cases, to provide strength and durability that the stock cast components could not provide. NOTE: When used under the harsh conditions and high rpm levels of mega engines, the stock cast components not only fail, but can explode destroying the vehicle, the engine and more seriously can lead to critical personal injury. FOR COMPRENSIVE DETAILS ON THE COMPONENTS USED IN THE MEGA TORQ CHECK BELOW. -GRADE 8 FASTENERS are used on all critical component mating surfaces. These fasteners prevent bolt breakage and loosenig of components due to bolt stretch. These fasteners assure continued torque application at all critical components that otherwise could result in leakage, fluid crossflows and destruction. In addition we utilize special stainless steel washers with integrated rubber "o"rings on all pump to case bolts. -6AN Aircraft Aluminum cooler line fittings provide secure leak free connections that will not crack or come loose under vibration. These fittings also create a substancially higher fluid flow rate than stock fittings. All of the internal fluid passages are increased in size to sustain higher flow rates than a stock 727 and provide the lubrication flow necessary to cool and lubricate under extreme conditions. 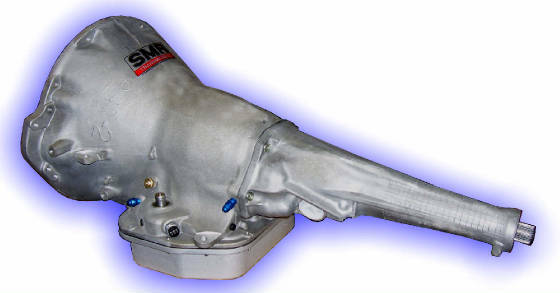 -DEEP SUMP CAST ALUMINUM PAN provides an extra 2 quarts of fluid, increasing cooling capacity and preventing lubrication gravitation under hard accelleration. This pan also increases the dynamic structural ridgity of the overall transmission to prevent distortion from high torque multiplication created by the transmission. The machined cast gasket surface of the pan assures a positive mating leak free operation. -EXTERNAL ACCESS PLUGS are provided (on Competition Models) to allow adjustment of line pressure without dropping the pan. A plugged hole is also provided to accommodate the future installation of a transbrake wire. -a NEW NEUTRAL SAFETY SWITCH is installed to accomodate safe starts and also to active BACK UP LIGHTS when required.